Double chocolate macadamia nut cookies look as good as they taste. The combination of the deep, rich, flavorful chocolate and the rich macadamia nuts make these cookies a treat any time of the year. Some cookies turn out better if the dough is allowed to rest before it is baked. 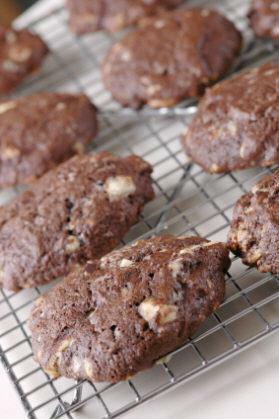 Double chocolate macadamia nut cookies turn out best if you bake them as soon as the dough is ready. If you let this dough rest, the cookies turn out crumbly, but if you bake them right away the cookies turn out very tender. In order to get the best texture from this recipe, you should use bread flour instead of all-purpose flour. The dough for this recipe is a bit firmer than a typical cookie dough and this means that the cookies don't spread as much as you would expect. The fact that the cookie dough does not spread means that you can form the cookies as thick as you want. Sift the cocoa, flour, and baking powder. Place a heatproof bowl over a pot of gently simmering water. Melt the butter and chocolate in the bowl, stirring occasionally. Let cool to nearly room temperature. Mix the sugar, eggs, and salt together until well blended. Do not whip to a foam. Whipping the eggs too much will cause foam and this will cause a crumbly cookie. Fold the sifted flour mixture into the chocolate mixture. Fold in the white chocolate pieces and macadamia nuts. Using a pair of tablespoons, drop the dough onto parchment-lined cookie sheets. Flatten to desired thickness; these cookies do not expand much. Bake for 10-15 minutes, depending on size. If you make very large or very thick cookies, they will need longer to bake than a thinner cookie. You can substitute your favorite chocolate for the white chocolate or just add a ¼ cup of chocolate chips for a richer chocolate experience. Once you make a batch of these cookies and taste how delicious they are, you're going to want more. You can easily double this recipe so you have enough for yourself and some left over to share.